FOR RICHER OR POORER, IN BUSINESS AND IN STEALTH. Can IRS Special Agent Tara Holloway break up a clever ring of tax cheats who love money, dishonor the IRS, and disobey the laws of justice? 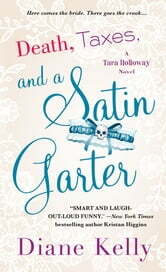 Tara Holloway returns in Death, Taxes, and a Satin Garter, the eleventh installment in Diane Kelly's hilarious series! Death, Taxes and a Satin Garter by Diane Kelly is the tenth book in A Tara Halloway Novel series. Tara Halloway is a special agent for IRS Criminal Investigations in Dallas, Texas. Her latest client is Florence “Flo” Cash who owns a local radio station. Flo has stated on her tax returns that the station is barely breaking even since she took over its ownership. Tara knows that Flo is being deceptive, and she is determined to get the truth. Flo is equally determined and uses the radio to voice her displeasure. Tara has also been assigned a special case by her boss, Lu Lobozinski. Three women have been “catfished” and they would like justice. Morgan Walker (an alias) dated each of the women and after three dates he asked them to a cash a check for him. After giving him the money, they never saw Morgan again (of course). The check would then bounce, leaving each women owing the bank. Tara has to think outside the box to catch this culprit. During her off time, Tara is busy helping her friend, Alicia plan her wedding and organizing the bachelorette party. This leaves little time for her relationship with fellow agent, Nick Pratt. 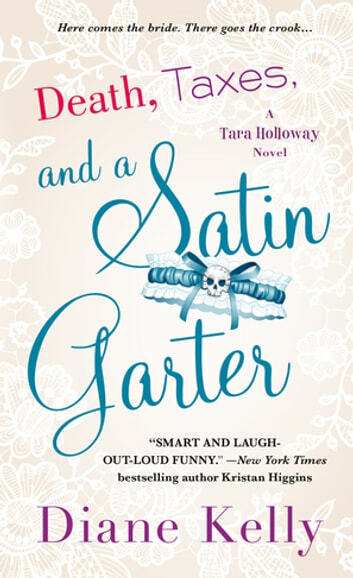 Read Death, Taxes and a Satin Garter to see if Tara will be able to reel in Flo Cash and Morgan Walker. Death, Taxes and a Satin Garter was an enjoyable book to read. I have to admit to chuckling a few times while reading this book. I liked the investigations. I had no clue was “catfishing” was before this novel (to me it relates to fishing). I also cannot imagine going to such lengths to avoid paying taxes. If Flo had put as much thought into her business, she would be wildly successful. While Death, Taxes and a Satin Garter is a part of a series, it can easily be read alone. We get the necessary background information needed to read (and understand) the book. I liked Tara Holloway. Tara comes across as a strong, determined woman. I liked the ending, and it will make readers sigh with pleasure. I give Death, Taxes and a Satin Garter 4 out of 5 stars (I liked it). The book has good writing, nice pace, a little romance, and just the right amount of humor. This book has introduced me to a whole new series to read. I will be adding more books to my TBR list. I received a complimentary copy of Death, Taxes and a Satin Garter from NetGalley and St. Martin’s Press in exchange for an honest review. The comments and opinions expressed are strictly my own. I will always give a forthright and unbiased evaluation.